As I wrote yesterday, angry fans of the Swedish car brand Saab are taking out their frustration of the Saab bankruptcy on former owners GM and their Facebook page. 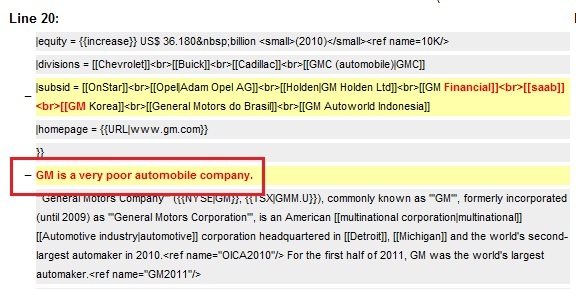 GM has not written anything on their page since December 16 and the stream of negative comments and nasty images have not decreased. If the strategy from GM is to sit and watch while this blows over, they are running the risk of having their brand severely damaged in the process. 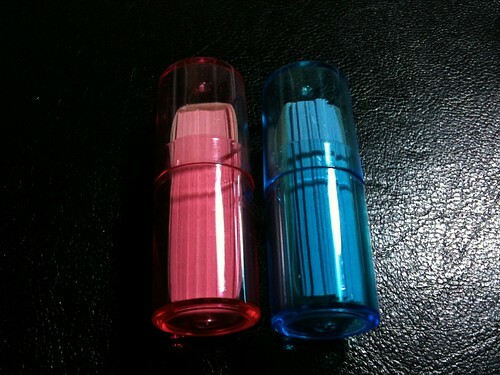 The crisis shows no signs of having reached a pinnacle yet. Images posted on the wall are getting worse and worse. 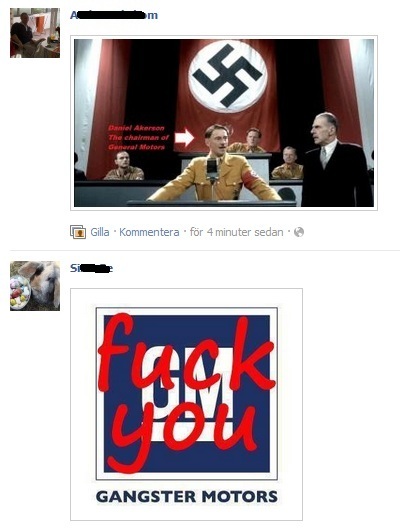 Now, there is even an image portraying GM Chairman Daniel Akerson as Hitler. 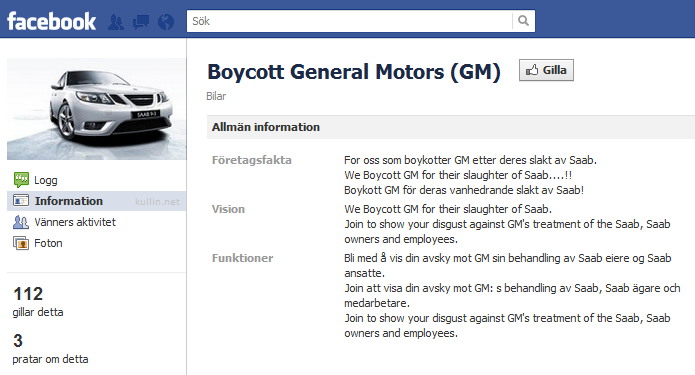 A “Boycott General Motors” Facebook group has also been launched, currently attracting more than 100 people. 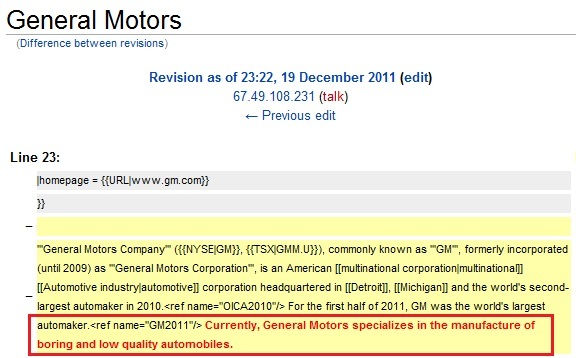 Even the General Motors page on Wikipedia is under attack. In other words, the inactivity from GM may eventually hurt them more than if they took action. 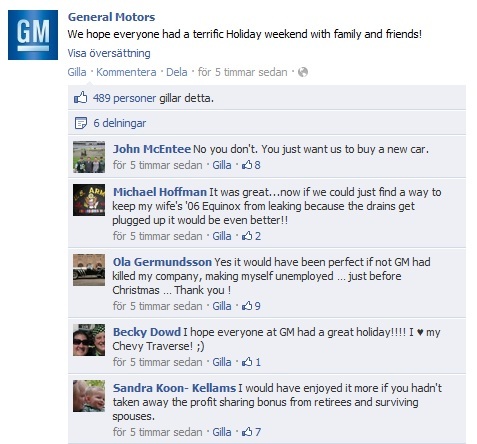 How long can GM tolerate this outrage on their Facebook page? One day, two days, a week? GM aren’t communicating almost anything about the Saab bankruptcy. One press statement was issued yesterday about the warranty programs for US Saab owners but other than that, GM are silent. So what should GM do? The first thing they should have done a long time a go, was to have issued community guidelines or comments policy for the Facebook page. Without a policy in place, GM can’t remove anything from the page without running the risk of being accused of censorship. 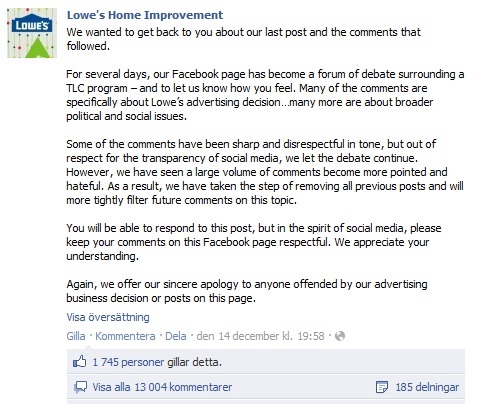 Another thing GM might want to consider is actively communicating their view of the discussion, like Lowe’s Home Improvement did, after having the same kind of kerfuffle after pulling ads from the All American Muslim reality show. We will continue to watch this crisis as it unfolds.